Penn State offensive lineman Connor McGovern runs a drill at the NFL combine in Indianapolis. When you weigh 320 pounds, shedding 12 of them is a tree falling in the forest. 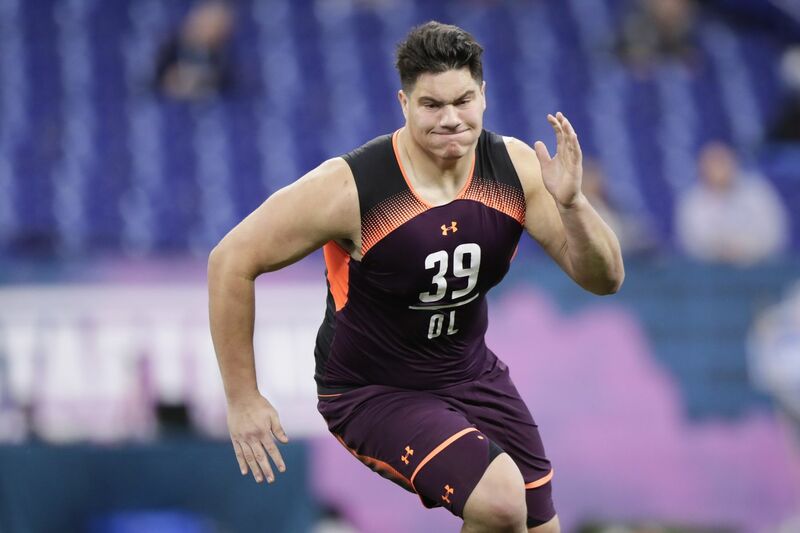 To the naked eye, Connor McGovern didn’t look any different last week when he showed up at the NFL scouting combine weighing 308 pounds than he did last season when he played right guard for Penn State at 320. But he didn’t lose the weight to look better. He lost it to increase his speed and athleticism when he worked out for NFL coaches and scouts at the combine and when he participates in Penn State’s Pro Day on March 19. “Some people have been questioning that,’’ the 6-foot-5 McGovern said last week. “Just being able to run at my size. McGovern did 28 reps in the 225-pound bench press at the combine, the ninth-best performance among the 57 offensive linemen there. He thinks he would’ve gotten into the 30s at 320. But he ran a very respectable 4.57-second 20-yard shuttle and a 7.66-second three-cone drill. Both were the ninth-best times in his position group. His 112-inch broad jump was the eighth best. Quenton Nelson, taken by Indianapolis with the sixth overall pick in the 2018 draft, ran a 4.62 20-yard shuttle and 7.65 three-cone, and had a 105-inch broad jump last year. McGovern does the bench press at the NFL combine. McGovern, a Northeastern Pennsylvania native, is projected as a second- or third-round pick in next month’s draft. His center-guard versatility — he started 21 games at right guard and 14 at center for the Nittany Lions and began his college career as a tackle — make him very appealing to NFL teams, including the Eagles, who place a high value on a lineman’s ability to play multiple positions. “I think I bring that versatility aspect to the table that not a lot of other guys have,’’ McGovern said. “A lot of [NFL] teams only travel with six or seven O-linemen. So you need versatile guys who can go in and play any of the five positions. “I just think my height, my athleticism, my length [34 1/8-inch arms] helps me a lot. I’ve prepared my whole life for playing both positions. And then, when I went to Penn State, they moved me to tackle. So I had all five positions down. McGovern is a dominating run-blocker who will need to improve his pass-blocking once he gets to the NFL. But he has all the tools to do that. “I like him, I like him a lot,’’ NFL Network analyst Charles Davis said. “He’s Quenton Nelson, but he’s not. Quenton Nelson is in another stratosphere from everyone else. While McGovern dropped weight for the scouting combine, Florida State edge-rusher Brian Burns was one of several guys who packed it on. Burns, a projected first-rounder, played last season at around 225 pounds, but tipped the combine scales in Indy last week at 249. Burns runs a drill during the combine. It was reminiscent of Clemson’s Vic Beasley in 2015. He was an explosive pass-rusher in college, but weighed just 230, and teams were wondering if he was going to be strictly a third-down rusher in the NFL. But he showed up at the combine at a muscled-up 245 and the Falcons took him with the eighth overall pick. “I put [the weight on] because I want to enhance my game to a new level,’’ said Burns, who had 10 sacks and 15 ½ tackles for losses for the Seminoles last year. “I want to work on [converting] speed to power. And with that, I need the weight for it. Even with the extra weight, Burns ran an impressive 4.53 40, the third-fastest time among defensive ends and edge-rushers. Burns said he has been eating 5-6 times a day. His daily calorie intake: 4,000. He said he’s received a lot of advice from Saints defensive end Marcus Davenport. Davenport, the 14th pick in last year’s draft, increased his weight from 240 to 264 before the 2018 combine. Said NFL Network lead draft analyst Daniel Jeremiah: “It would be an interesting study, for as much as colleges are paying their strength coaches, I understand that there’s a limitation in terms of time [at the college level]. But every year, we’re seeing kids that are putting 20-30 pounds on before the combine. “Look at Burns. Look at [Washington cornerback] Byron Murphy. I think he weighed in at somewhere around 195 here. In college, he was in the low 180s. That’s a lot of weight to put on at a speed position. This year’s draft has something that’s rare in most drafts: tight ends who not only can catch the football, but also can block. “There’s a handful of them that can actually put their hand on the ground and block people,’’ Jeremiah said. “I mean, you can go years without seeing more than one or two guys actually able to do that. “Teams have to project, like, OK, he runs hard and he’ll run over guys with the ball in his hands. So there’s a component of toughness there, and maybe we can teach him how to block. But there’s no actual evidence they can really do it.